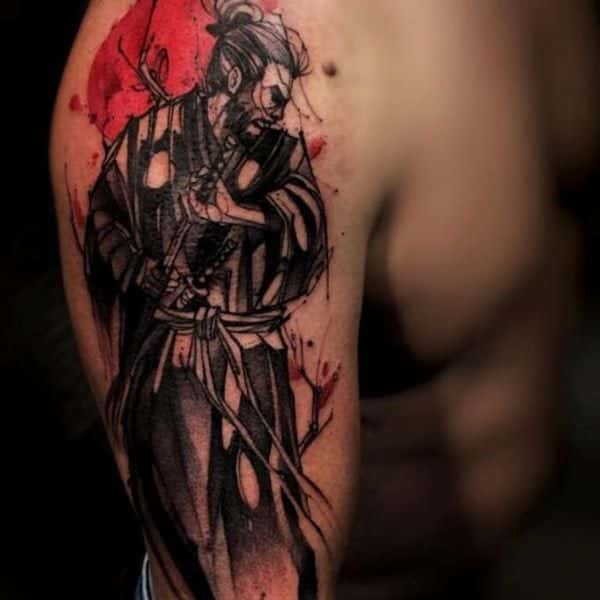 If you are looking for a tattoo that will make you feel a little badass, then you are sure to love the Samurai tattoos. They have been popular for many years and they never go out of style. You never stand a chance against the discipline that comes to martial arts. The martial arts are also great at overcoming the fear of killing or being in combat. That’s what makes you feel so badass, knowing that you are part of something that protects you. 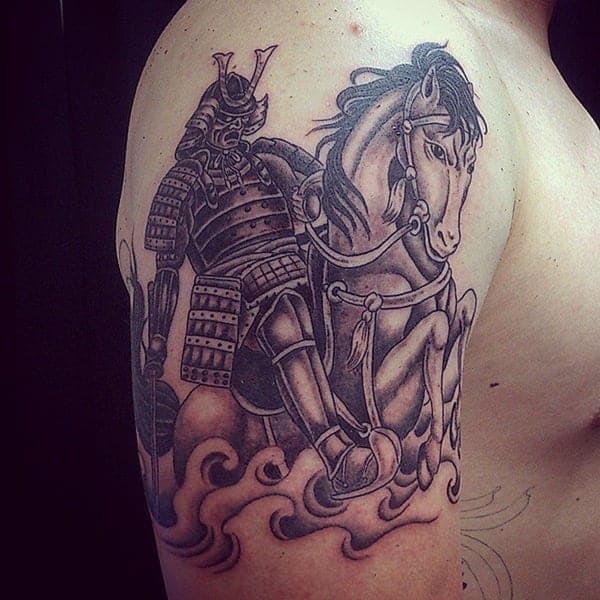 What is the first thing that comes to your mind when you think of Samurais? Would it be the sword? Of course, it is, it’s one of the coolest aspects of it. The important thing about the Samurai sword is that it holds power and we should know where that stems from? The martial arts are all about honor, courage and respect. These are the values they hold tight to in order to help them through times that are chaotic. If you believe in those core values as well then why not represent them through a tattoo. They also used meditation to help them through the tough times and to allow them to have razor sharp focus at all times. 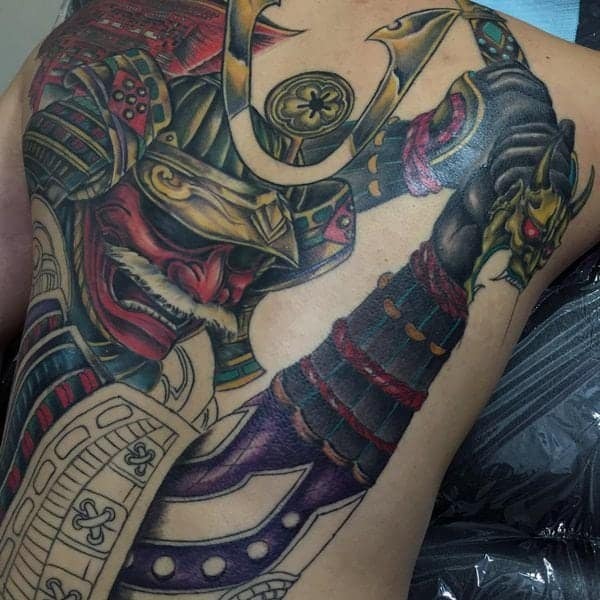 This incredible tattoo is all about detailed and it looks pretty awesome as well. 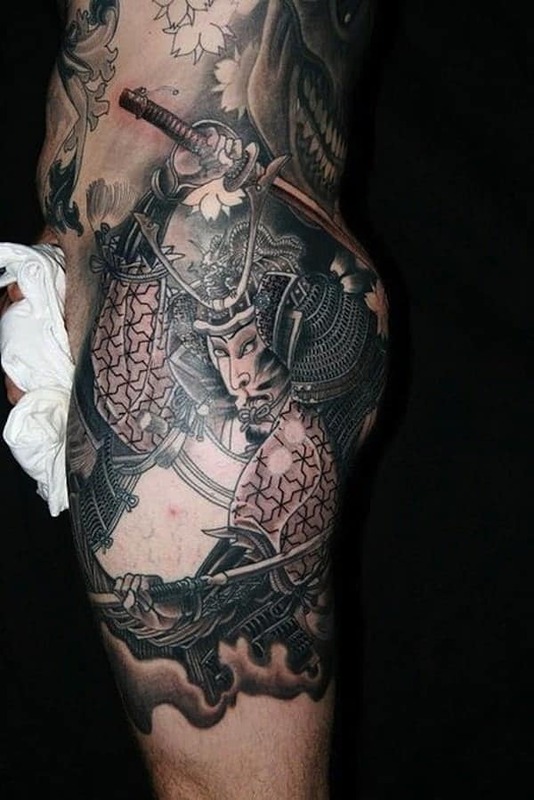 If you are looking for a large tattoo, then this may be the one for you. There is a lot of amazing coloring with this design. 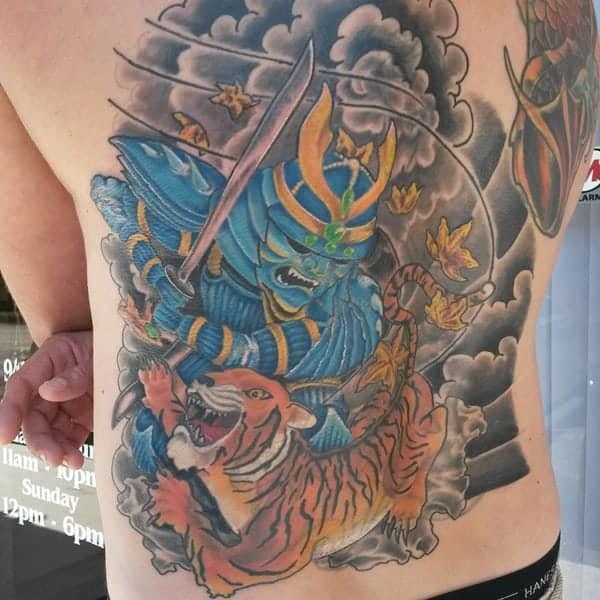 This Samurai is fighting a tiger and their battle looks ferocious. 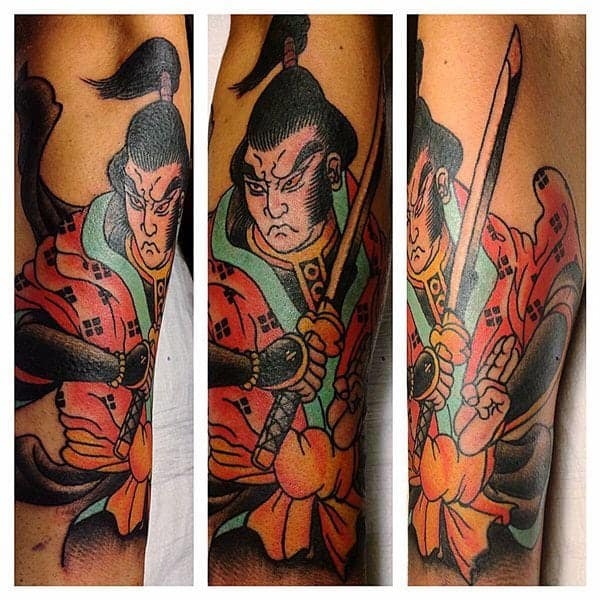 This stern fighter makes for a great arm sleeve design. 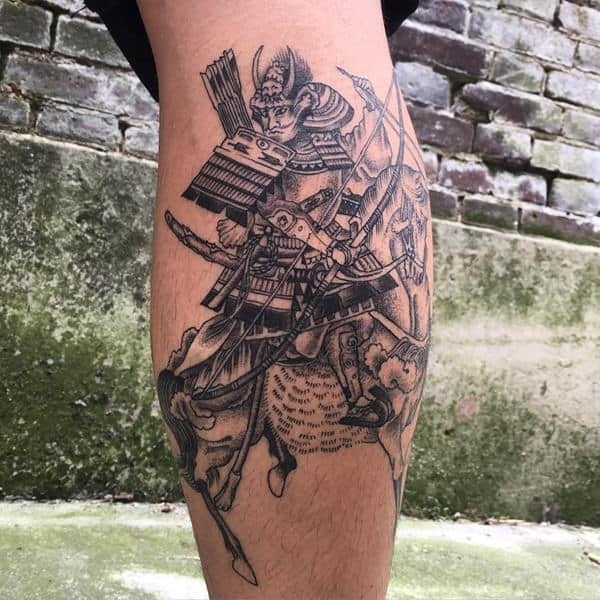 This is a design of an old school Samurai and the detail is incredible, it looks like a drawing. The dark shading also brings on a whole other look to the design as well. 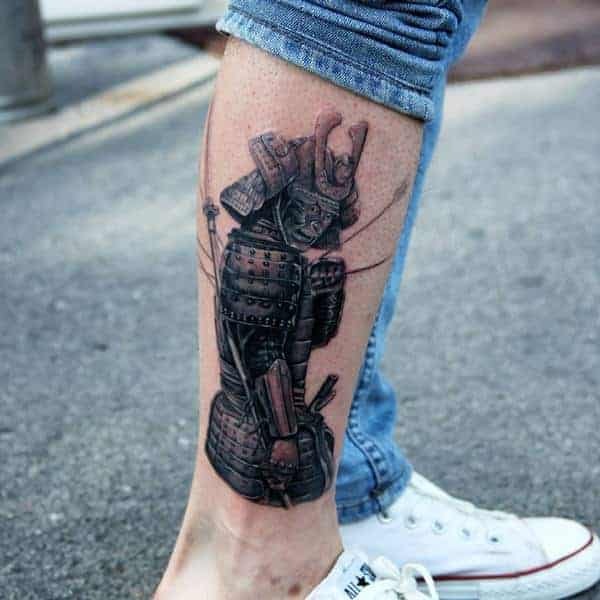 You are sure to love this incredible tattoo design. 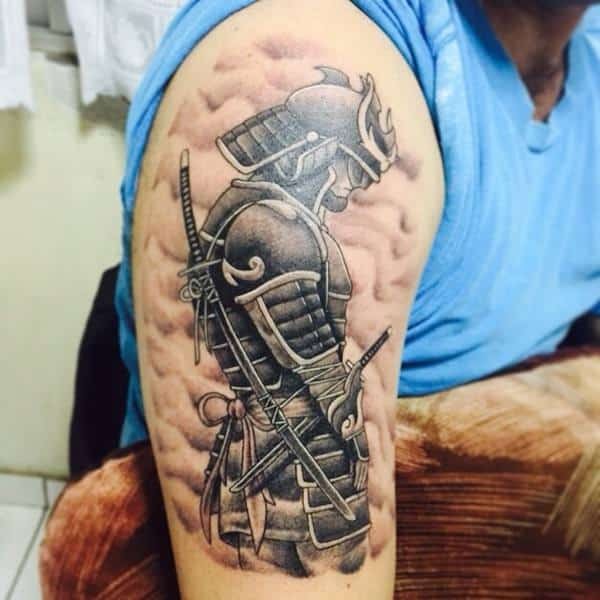 For this sleeve design, you just see the face of the warrior, but that’s all you need. I love the scar that they show on the face. You don’t need the full body image to have a great tattoo. There is a lot of emotion involved here. 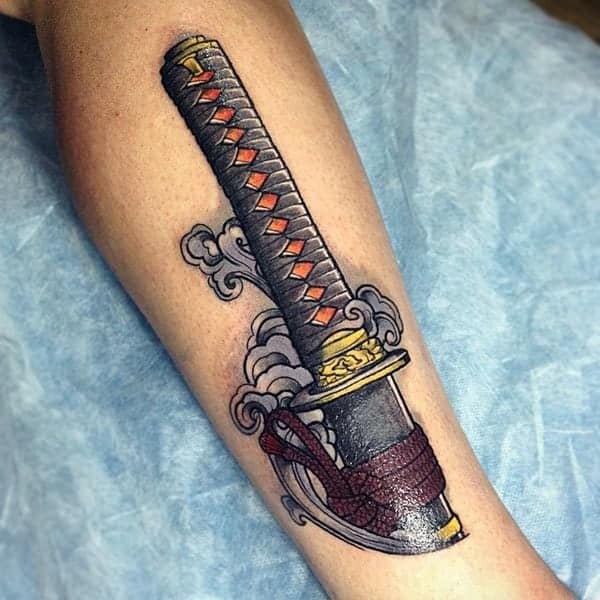 The Samurai sword is one of the most popular aspects of Samurai tattoos. You can’t go wrong with this amazing design. The floral elements add a little mystery to the overall design. 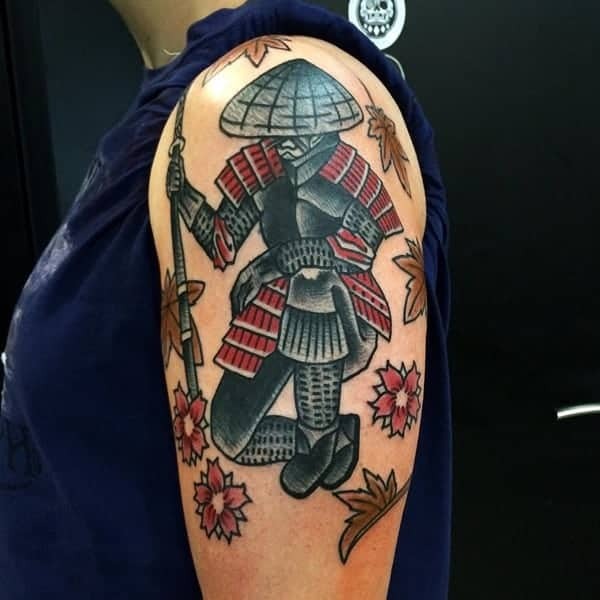 This is a very traditional design when it comes to Samurai art. 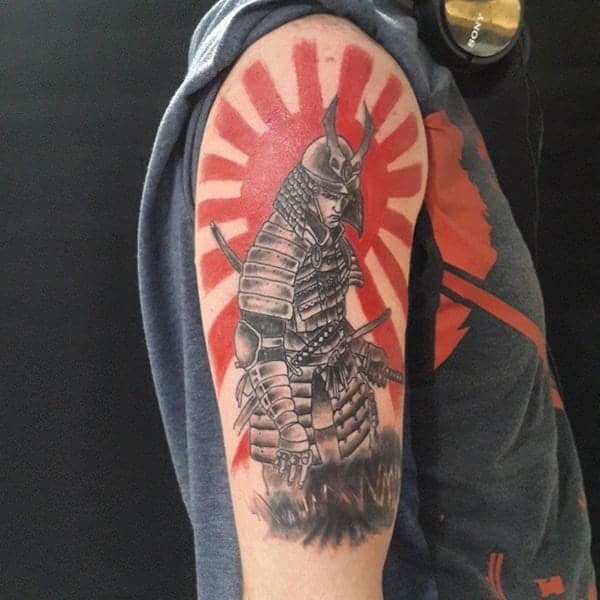 The red sun behind the warrior is a true traditional aspect. This warrior looks like he is having a reflective moment. The red sun just makes the whole image pop. A Samurai warrior that has a lot of bold colors. There is a lot of fire involved here as well. Green is an unusual color for this type of design, but that doesn’t mean that it’s a bad thing. It’s okay to experiment with color. It goes a long way. 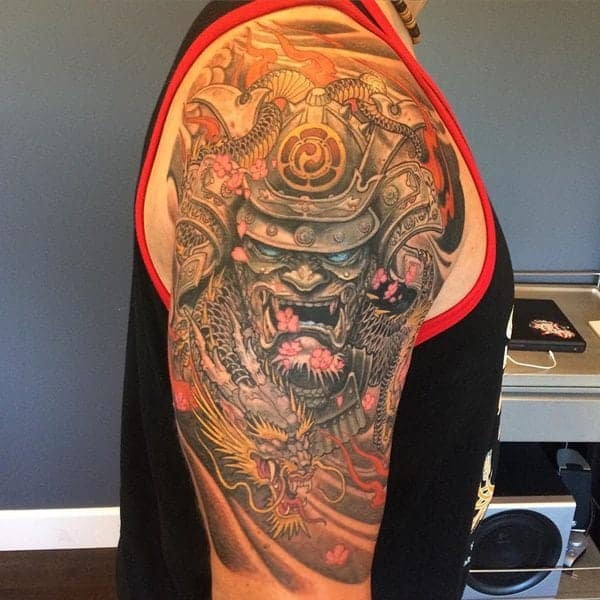 This detailed tattoo has some seriously amazing elements to it. The details involved here are truly amazing. You won’t find a more badass design than this one. This warrior trains by staying blind, that way he can become a master. It’s a common practice amongst Samurai’s because they want to be able to use their others senses in battle as well. 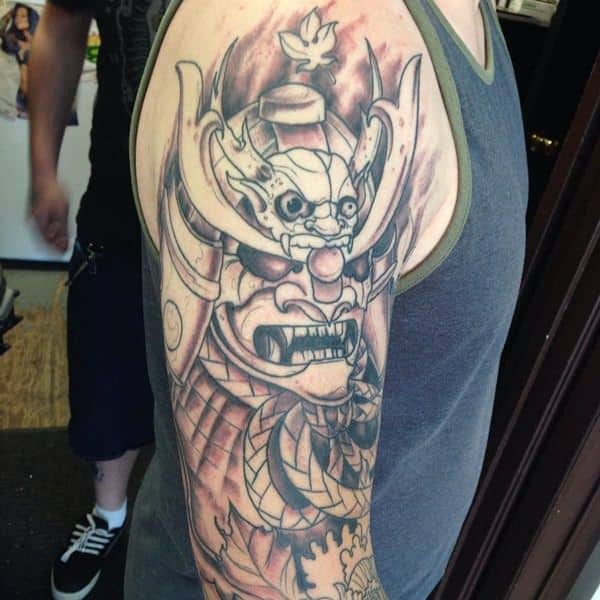 If you are looking for a detailed tattoo, then you can’t go wrong with this tattoo. 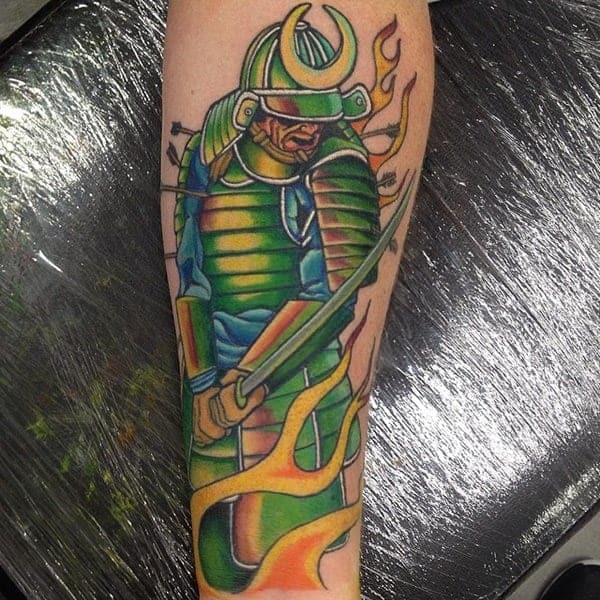 This tattoo is truly amazing and a little badass. 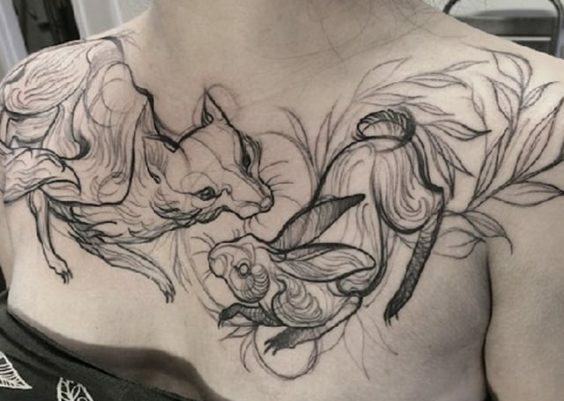 I like the fierceness of this tattoo; it’s part of what makes it unique. 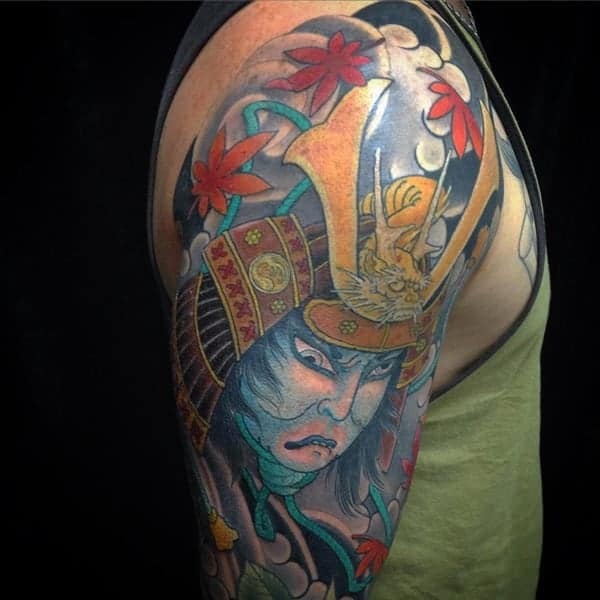 This sleeve tattoo has a lot of great colors to it. Details and colors make for a great tattoo idea. What a creative design if you are looking for a shoulder sleeve. You can see the fierceness in the warrior’s eyes. I just love it. 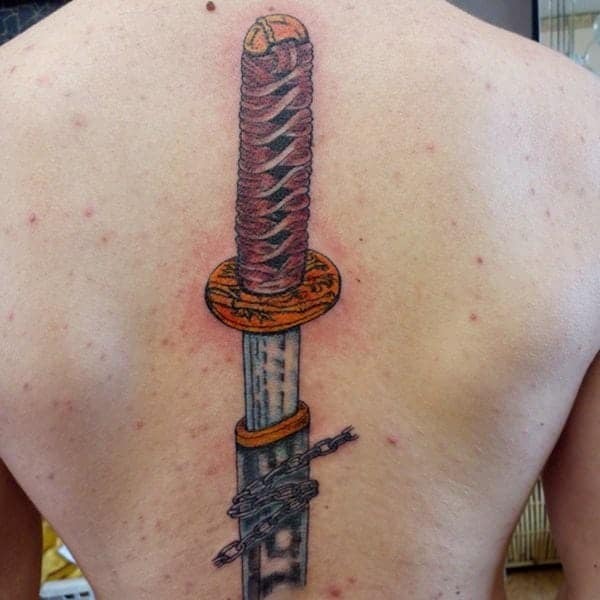 A great sword tattoo that is sure to brighten your day. 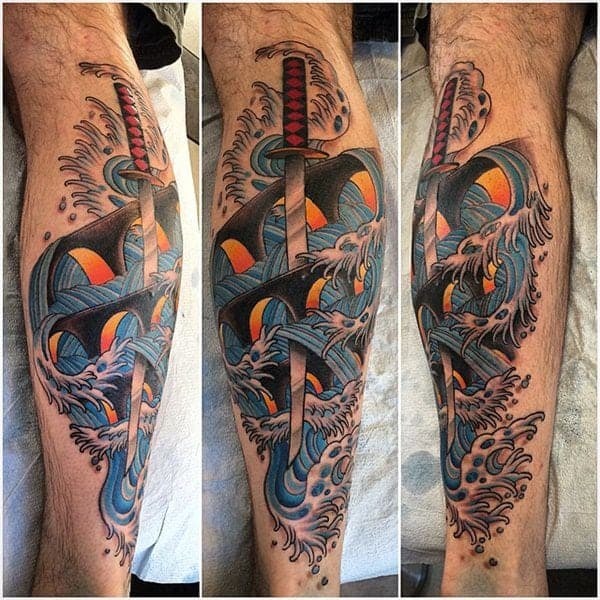 In this design, the sword has been sheathed and it’s one that you are sure to love. 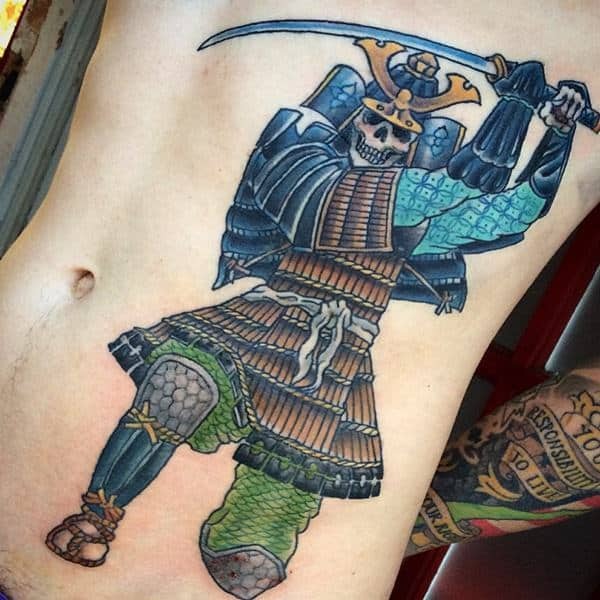 This badass warrior is from another realm, or maybe he’s just part of the walking dead. Either way, you won’t find a tougher tattoo than this one. The addition of skulls at the bottom makes it that much better. 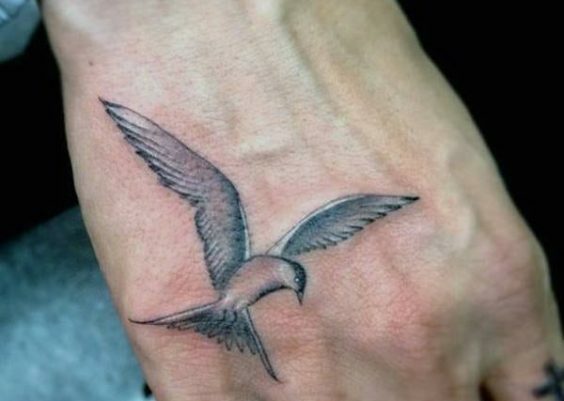 I love the shading involved in this tattoo because it’s realistic. The sword has been thrown into the ocean, or maybe it’s trying to escape on its own. The colors are also fun. It’s more of a cartoonist image but still fun nonetheless. Blues and reds look great together. 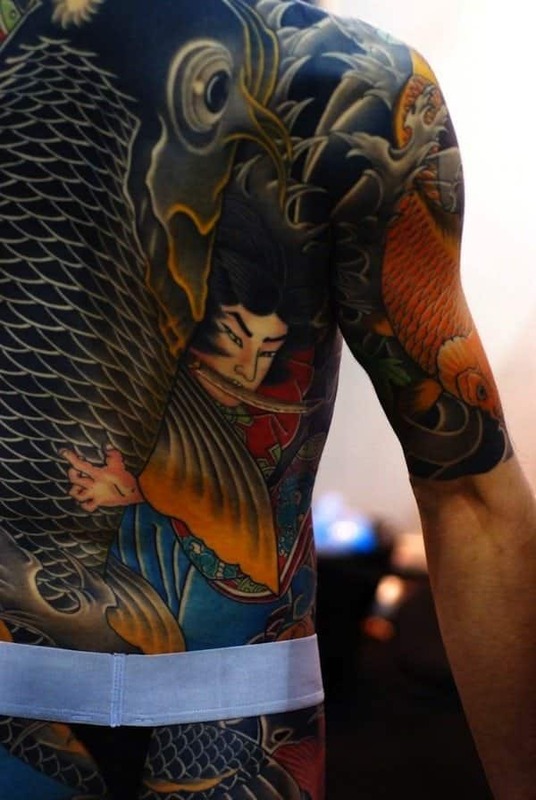 You don’t need a lot of details to have an amazing tattoo. It’s a fierce warrior and one that is truly amazing. 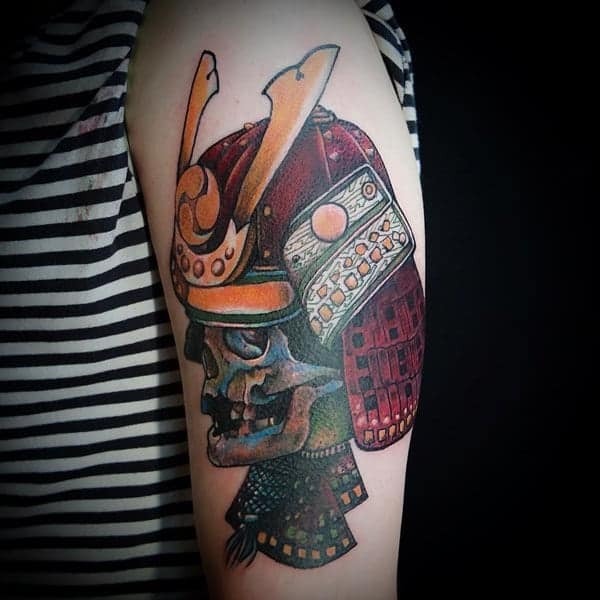 A great design of a skull with a Samurai helmet on. 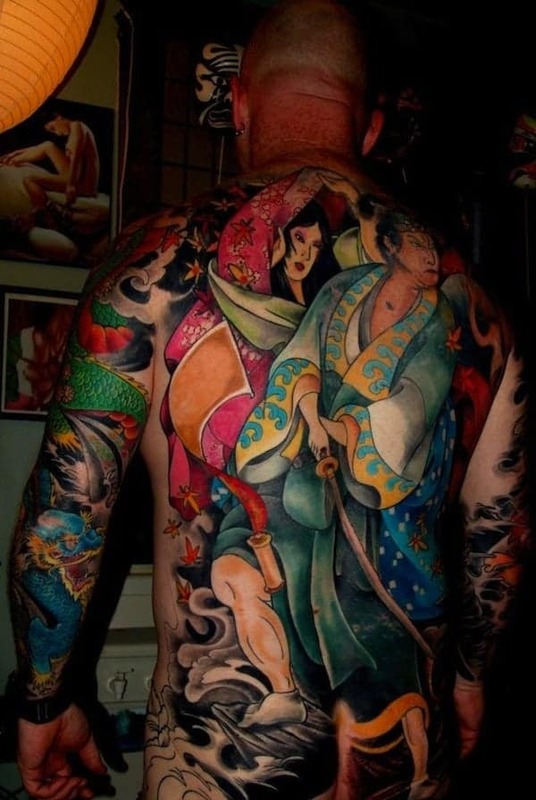 I love the bold colors that are involved with this tattoo. 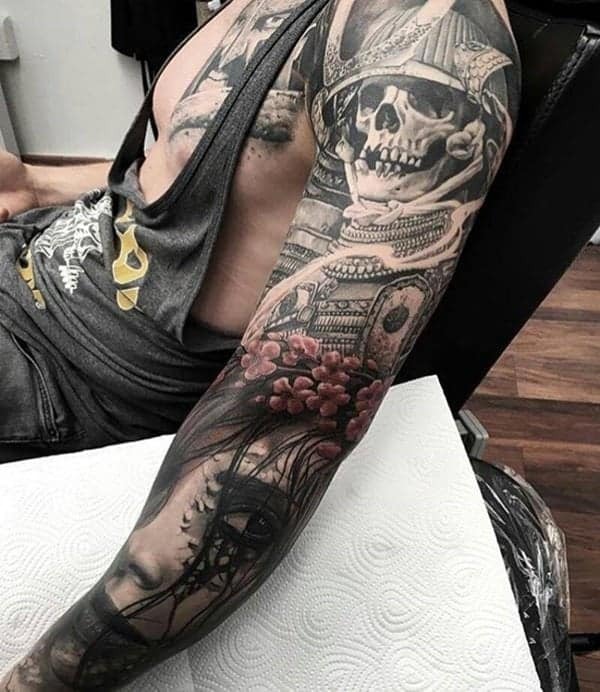 A great tattoo that has a lot of dark details to it. 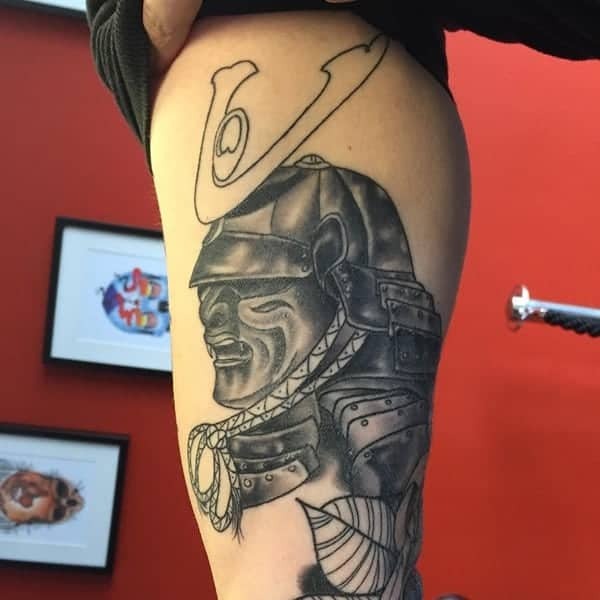 There aren’t a lot of details to this tattoo, but it still is a pretty cool design. There red and black together are really good together. 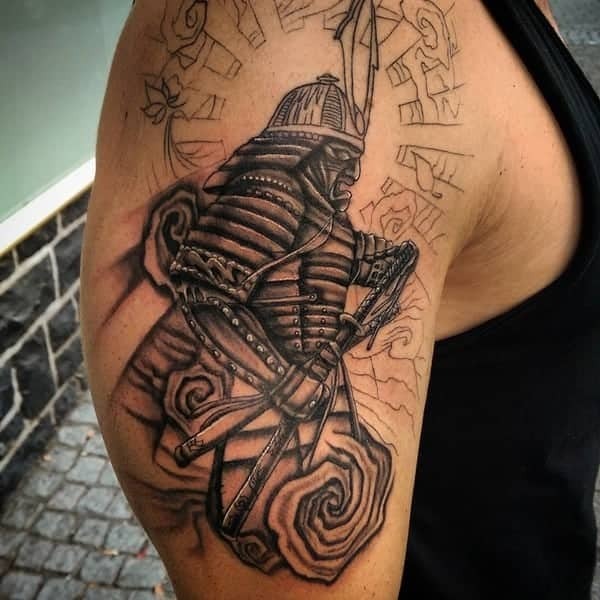 A rather large tattoo design that you are sure to love. 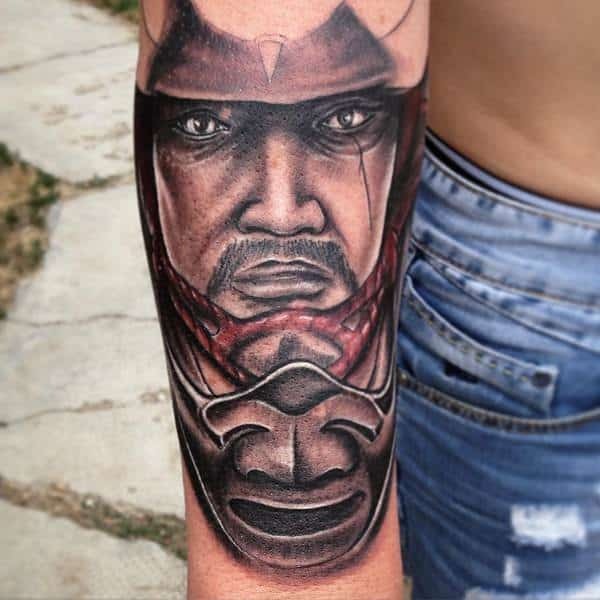 There are a lot of details here that make for a wonderful tattoo. 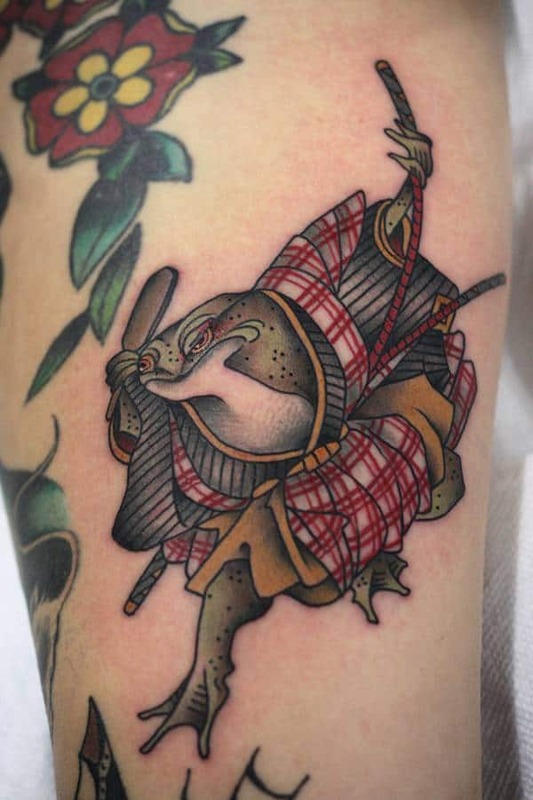 A great design because here we have a warrior who is a deep thinker. It’s a stunning design that you are sure to love. A great design with a lot of bold colors. The look on the warriors face is a little unusual, but maybe he has the case of the crazies. 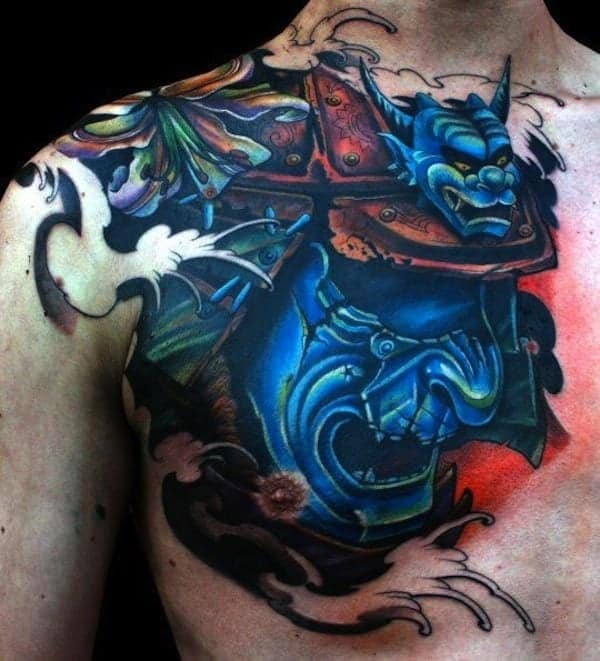 I love the amazing colors that are part of this tattoo design. It’s a fierce warrior that has pride in his colors. 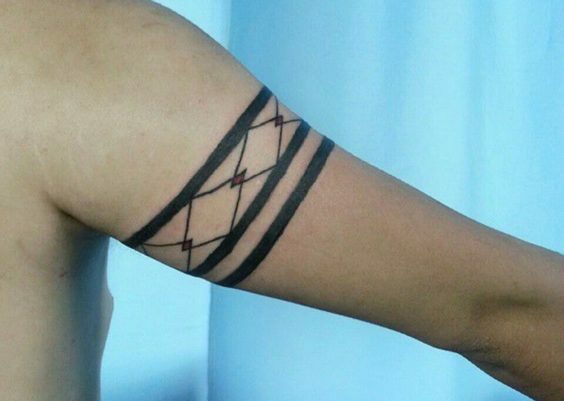 This tattoo is very dark, and a little mysterious. We can’t help but love the detail involved in it as well. The scary warrior is out of the ordinary but truly awesome. If you love this bold coloring, then you are sure to love this design. 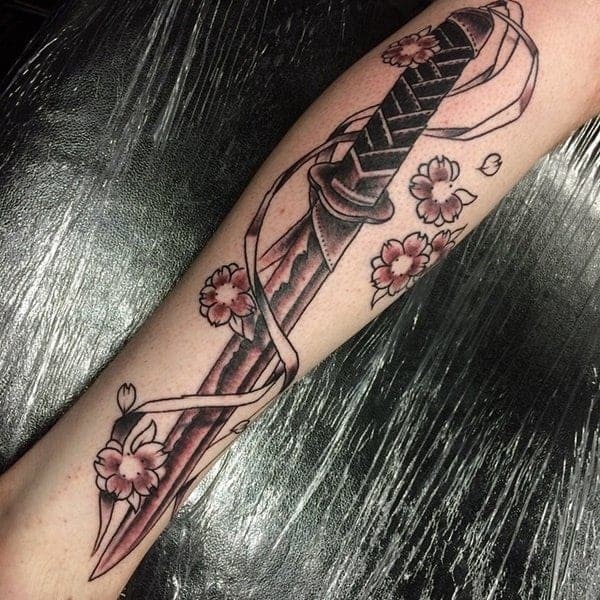 It looks like the sword is embedded in the skin. It’s a great design choice. 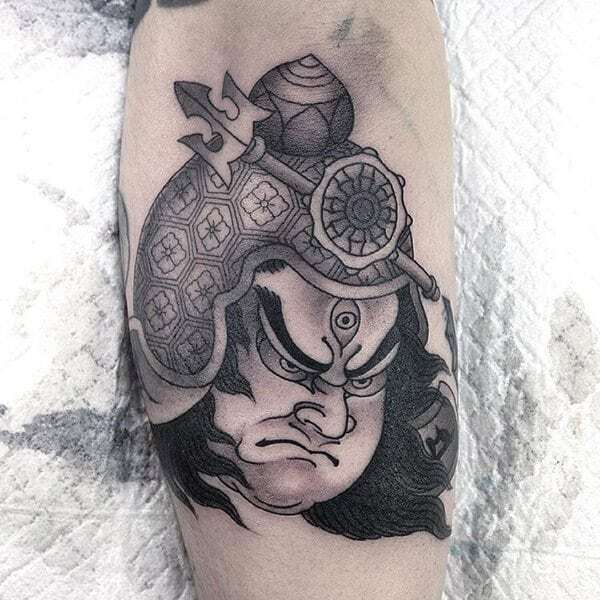 The disgruntled look is a common one when it comes to Samurai warriors and that’s usually because warriors are tough and focused on the task at hand. This design looks very much like a portrait. It’s stunning and so detailed that it could be a photograph. 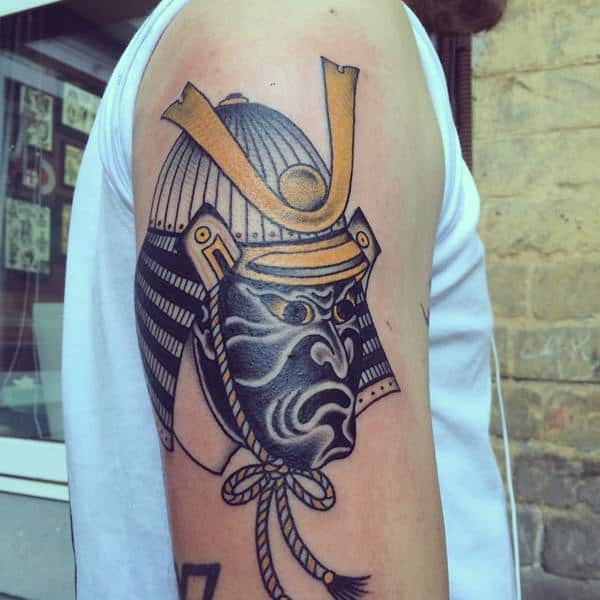 Black and white tattoos are always great and in this case, it’s a little dark as well. 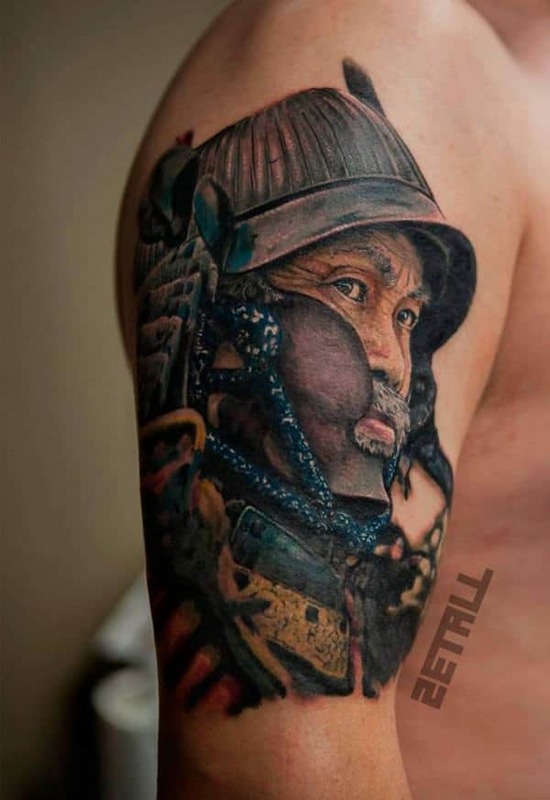 It’s a dead soldier long passed, but the detail and mood around the tattoo are incredible. We all can be warriors even this guy. 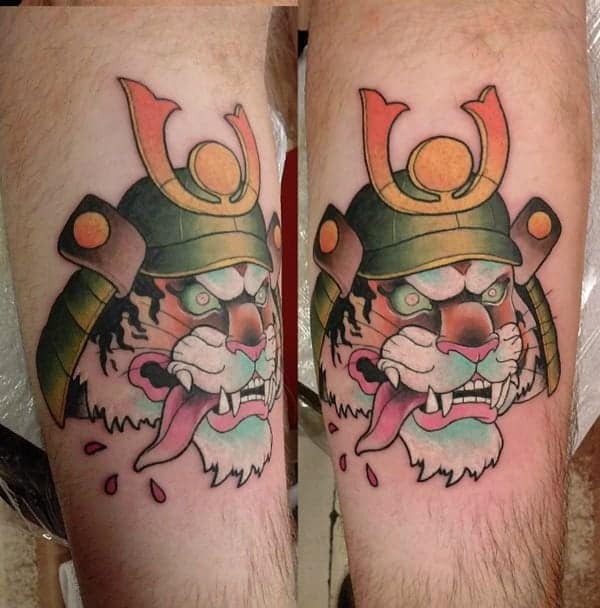 An interesting take on a warrior, in this case, it’s a tiger and he looks like he’s hungry for a fight. A great design that you are sure to love because it’s dark and wonderful. 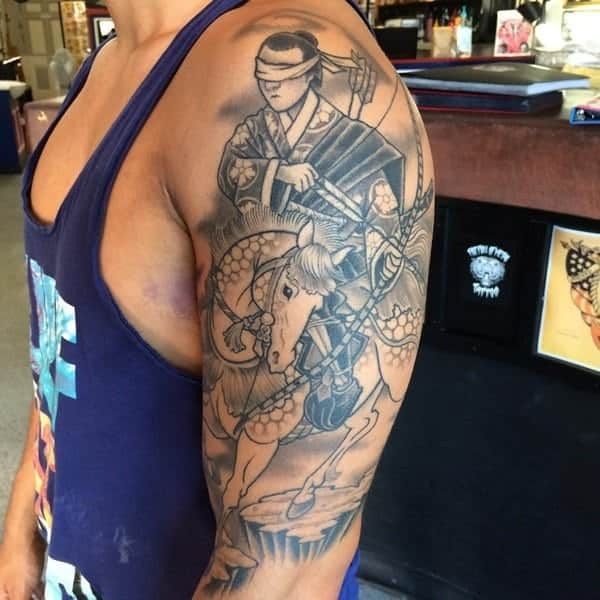 This Samurai warrior has a Geisha girl in his midst. 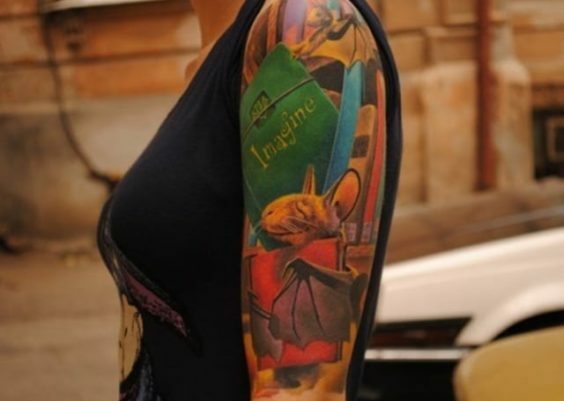 It’s a detailed tattoo that is truly magical. This Geisha is right up there with the Samurai warriors. We can’t get enough of these amazing designs with bright colors. They are truly one of a kind. 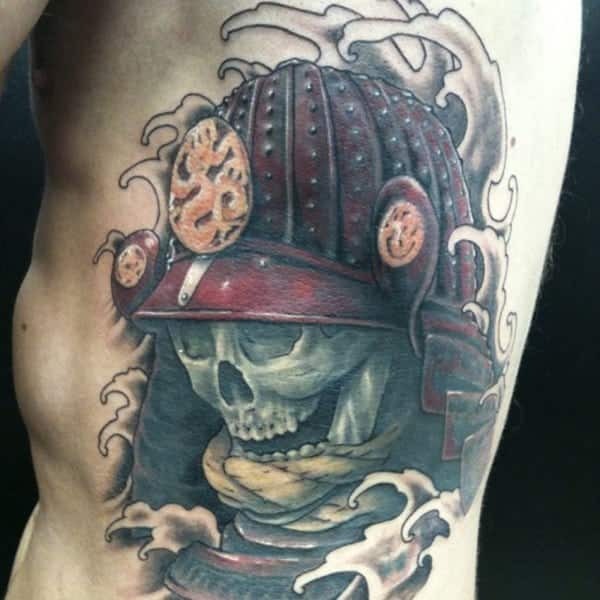 Another great example of a tattoo that is full of great details and dark shading. It’s another warrior with a weird expression on his face, but it’s original as well. 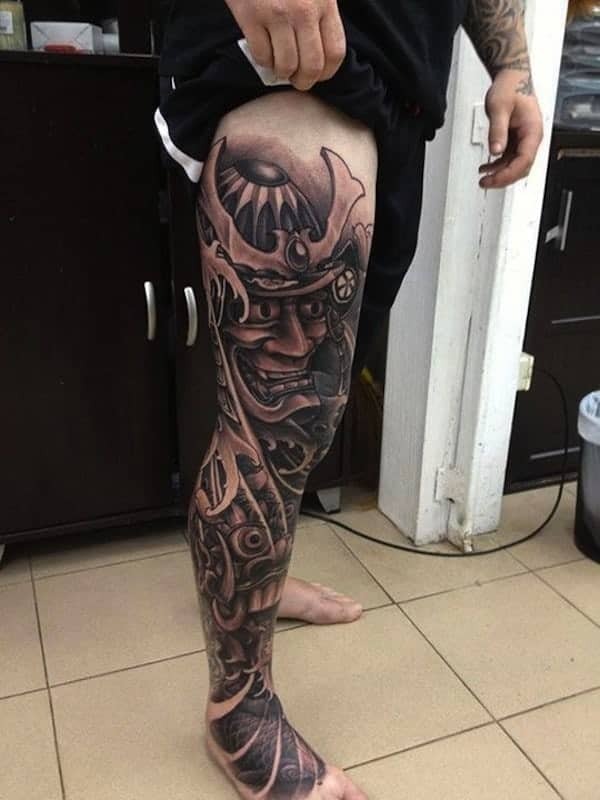 If you want a truly badass tattoo, then this leg design might be what you’re looking for. The faces of the warriors are really badass and you won’t see too many like this one, so it’s original design as well. I like the exaggerated features. 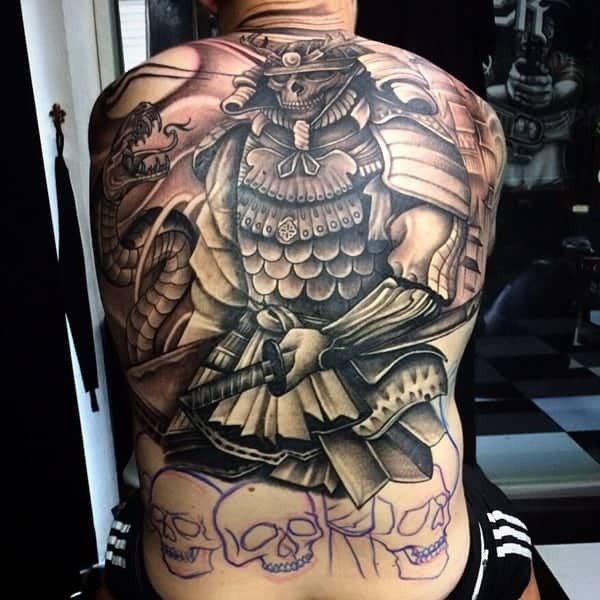 The back tattoo is detailed and colorful. If you want something bold and bright, then this is the tattoo for you. It’s a different kind of warrior and one with a little mystery. I love the colors involved here; they are so vibrant. 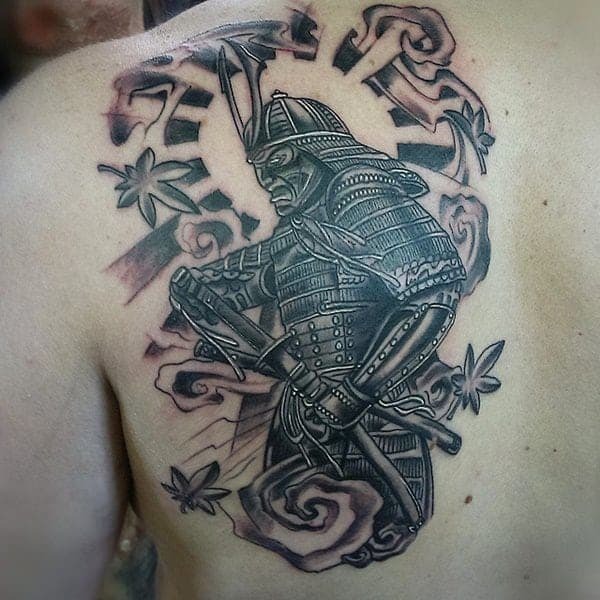 If you want a Samurai warrior tattoo but one that is a little different then you are sure to love this design. Meditating is an important part of being a Samurai warrior. 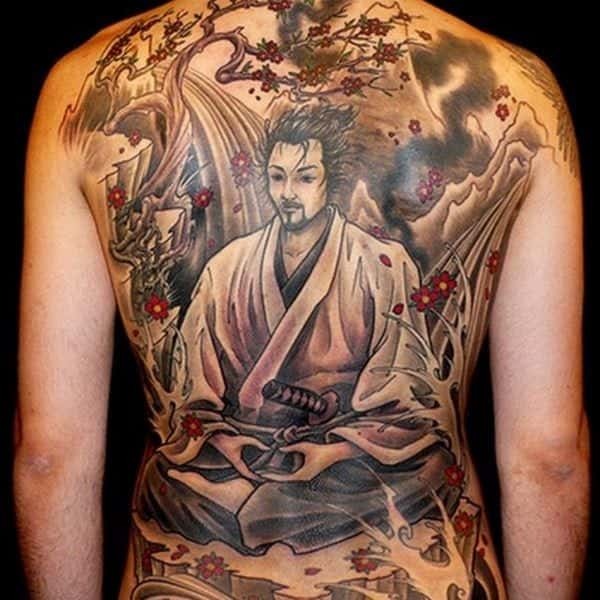 In this tattoo, there is a lot of great background scenery that fills up the back. The warrior is in the middle and he’s looking rather reflective. There isn’t a lot of colors here, but the red does make the rest of the image pop. Another great example of a dead warrior skull. These are cool tattoos because the skulls make them a little more badass than normal. I love the design and it’s truly inspiring.